I found some broccoli di Cicco in the grocery store a day or so ago; it looks like broccoli raab/rapini, but after a little research on the web after cooking with it, I found it to be an Heirloom sweeter variety of broccoli; all parts are edible (I thought so - I nibbled on a little of the stalk and leaf raw and it seemed like it would be good cooked). Anyway, my wife is back! She had a long journey, almost 30 hours from India! Her flight was late and I wanted to make something that I could put on the table quickly so she could eat and get to bed. I set some Lundberg Farms Black Japonica short-grained black and medium-grained mahogany rices to cook in my rice cooker. I thought that I'd make a simple saute of the broccoli di Cicco and serve it with salad and the rice, but I had some shredded potatoes on hand (I had made hashed brown potatoes for breakfast and had shredded too much, so kept the extra soaking in water to keep it from browning). So I did something unusual - I sauteed the broccoli with the potato and shallot slivers (I used mainly olive but also a little hot sesame oil), not letting the potato rest and clump together as it would were they hashed browns. When the potatoes were lightly brown, I added a little bit of salsa! 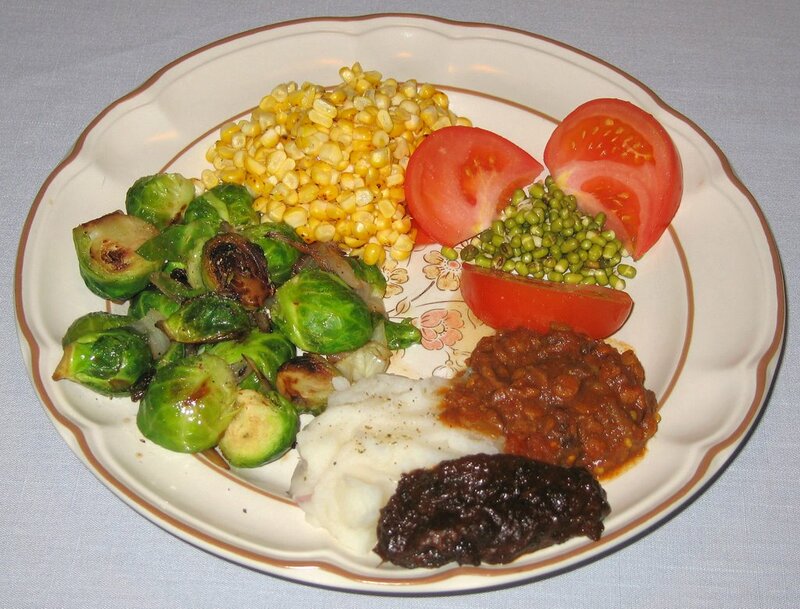 My wife enjoyed the dish - I thought it was interesting and reasonably good. I'm looking forward to my wife's return tomorrow night - she should already be enroute on her more than 24-hour journey from India. 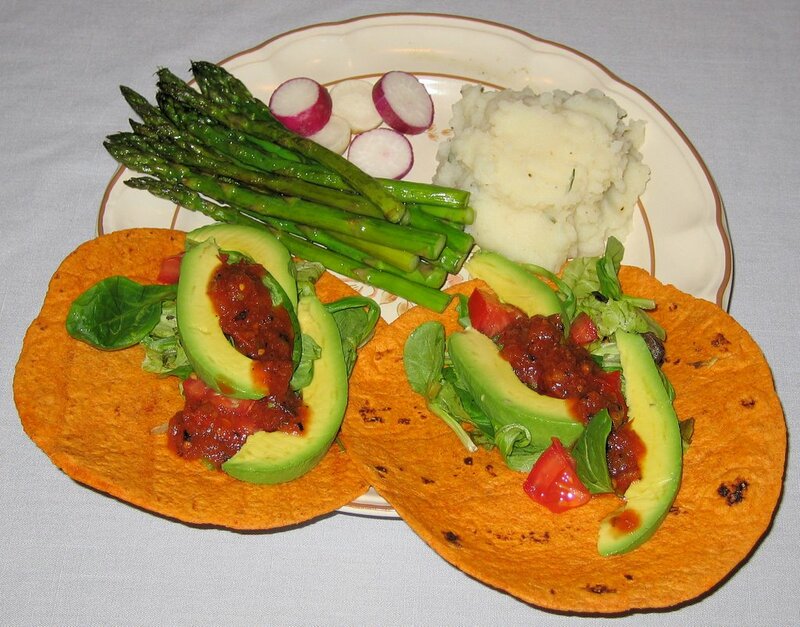 She isn't a fan of tortillas, and I have a few red chili ones left, so I made a simple dinner with avocado, locally grown baby lettuce, mache (lamb's lettuce), tomato, and salsa. I also grilled some asparagus with rosemary and garlic. I made mashed potatoes, and mixed in the rosemary and garlic when they were cooked. 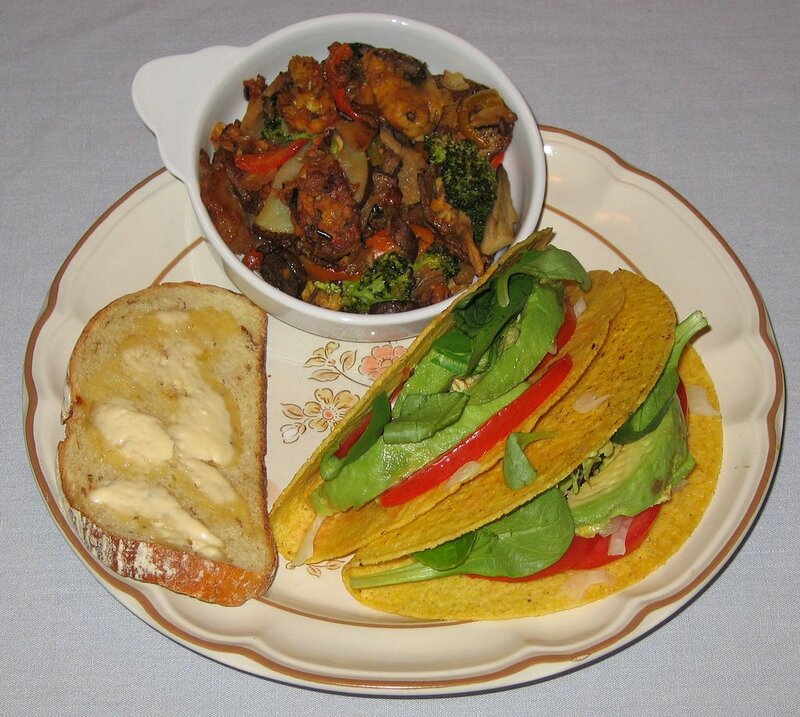 I made another simple meal, tonight out of winter squashes. 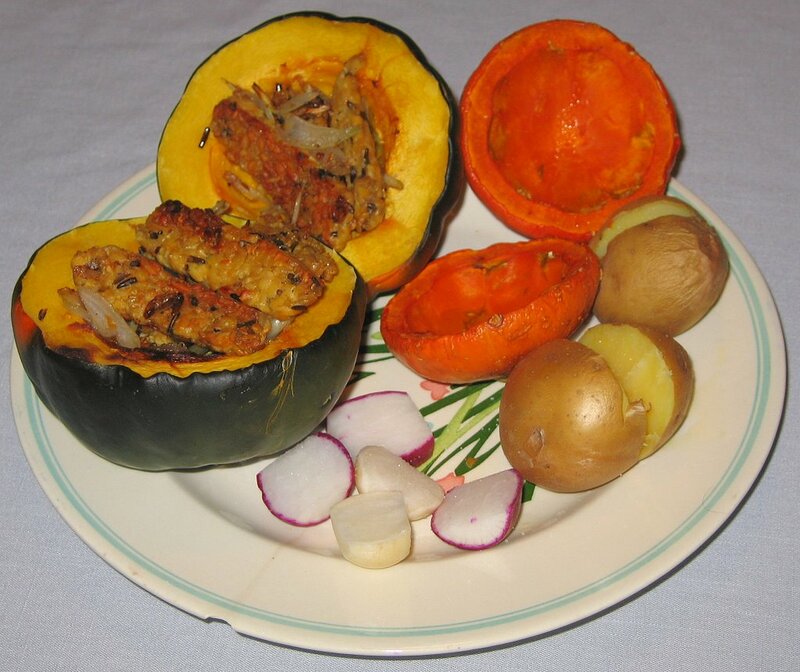 I cut acorn and golden nugget squashes in half and removed the seeds. I baked in a 375°F (toaster) oven for about an hour, along with two small Yukon Gold potatoes. When the potatoes and squashes were almost ready, I quickly sauteed some tempeh and shallots, which I served inside the acorn squash halves. I also served some radishes. I always enjoy squashes like acorn and butternut. I hadn't had golden nugget before; it was rather bland and, even with some olive oil and salt, wasn't a winner. I'm taking advantage of my wife's absence to repeat one of our favorite meals - I made fajitas for her probably in spring of 2005. I know she loved them, and I'm wondering if I can come up with a variant to try on her. Anyway, I made my fajitas tonight. I've never had meat fajitas, so don't know how alike my dish is, but in my cooking class, my students make fajitas and they say that there is a good resemblance. It's a rather simple preparation - in a little bit of olive oil, I sauteed over medium-high heat big chunks of half-moon shaped onion. As the onion became clear, I added thin but long pieces of seitan (wheat gluten). When the seitan was nicely browned, maybe 7 minutes later, I added thick slices of bell pepper and cooked just another minute or two. 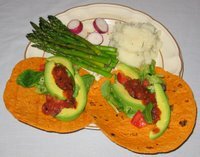 I served this in a red chili tortilla (at least to me, obviating the need for salsa) with locally grown baby lettuce leaves. I finished up one piece of olive bread and roasted two ears of corn, stripping the kernels and mixing with fresh squeezed lime and vegan margarine as well as salt. It's that time of year that I need to harvest my basil before frost kills it. We had a threat of frost a few nights ago, and I harvested all of my basil. Today, I made pesto - and was very pleased with how tasty it came out! I first washed and dried the leaves, then put them in a food processor, along with maybe half a dozen small cloves of organic garlic. I added enough olive oil so that the final product wasn't grainy and wasn't runny, and used very good extra virgin oil - I finished a little bit of an artisinal imported Greek one whose bottles are hand-numbered, and broke open an organic bottle of oil that I brought back from Assisi in Italia - locally produced there. I also added a little salt, a few slices of roasted tomatoes, Eat in the Raw's Parma! vegan "Parmesan cheese", a little bit of freshly ground black pepper, and a big handful of walnuts. I blended it all together, made adjustments, and came up with a big batch of very tasty and fairly garlicky pesto! I had a friend over for dinner; the only bad thing is that we had only a half hour to finish a meal we'd both much prefer to savor, but we had tickets to go to a play. 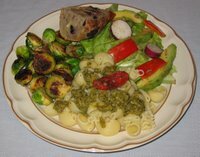 I served the pesto over pasta, grilled some Brussels sprouts and added smoke flavor, and served a salad and some olive sour dough bread, lightly toasted. Gustoso! The pesto was so tempting that when I got home, before going to bed, I had to dip a teaspoon in and get an additional small, maybe 1/16 teaspoon, sample! I taught tonight and, since I also taught on Tuesday night and ate at my parents' then, and since my wife is still away, I decided to cook anyhow and eat a late dinner. It was a simple meal - I heated the autumn poem Asian green that I had made on Monday, while also grilling sliced apple-sage artisanal vegan Field Roast Grain Meat Company sausage. I mixed them together - and enjoyed the greens much more than I had on Monday. I also grilled a Southwest Organic Sunshine Burger and served it on delicious olive sour dough bread. I'm teaching three nights in a row; last night, I went to my parents' and had my Mom's home cooking (we had several Indian dishes). Tonight I taught a little later than usual, so had time to make a quick meal. It was simple but tasty and filling - I heated the sauteed vegetables with tempeh from Sunday night, and made two tacos. I also served toasted sourdough bread. Today I experimented with a green that I purchased this past weekend at the local farmer's market. Known as Autumn Poem, it is an Asian green whose stalks, relatively insignificant leaves, and yellow flowers can all be eaten. I read that it can be cooked down about 15 minutes till soft. I sauteed some slivered onions in hot pepper sesame oil, then added coarsely chopped stalks of Autumn Poem, maybe an inch long. I put some salt in, stirred, reduced the heat, and simmered for about 10 minutes. Then I added, coarsely chopped, the tender leaves and flowers, and cooked for another 5 minutes or so. I added some vinegar-based hot sauce and served. 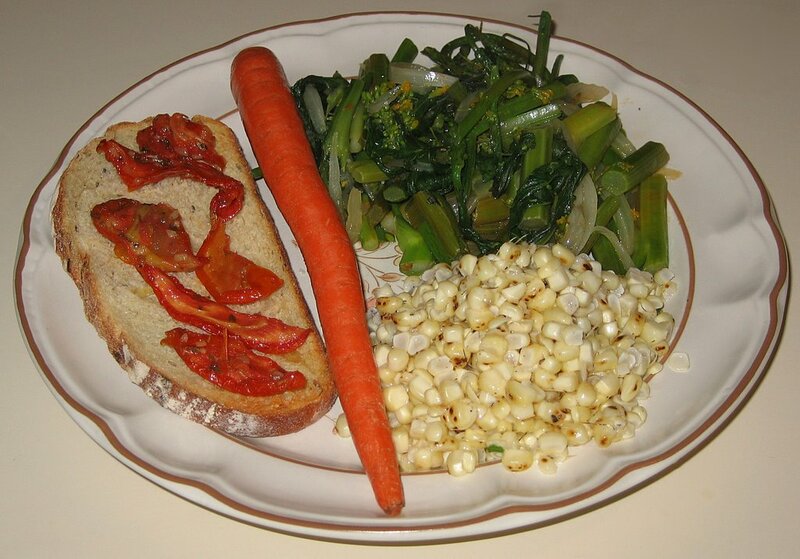 I also served grilled corn-off-the-cob with fresh lemon juice and non-dairy margarine and salt, and roasted tomatoes on toasted potato-onion-rosemary bread. When I was almost done cooking (too late! 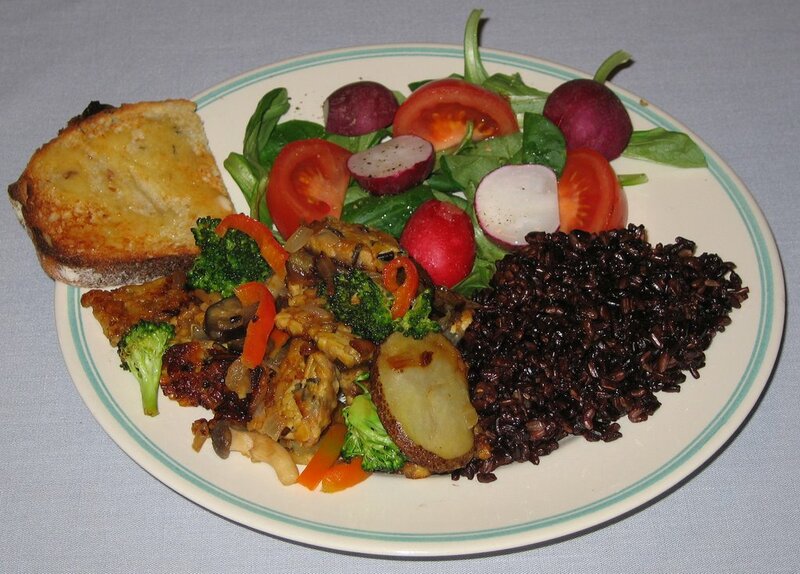 ), I came up with the idea of including chunks of tempeh with the greens. I have leftovers, so may do this later this week. The greens tasted interesting, but I don't think they will become a favorite of mine. It's been a long time since I've posted - or cooked! I have missed cooking, but have a great "excuse". I had the fortune to enjoy a vacation in Italia! The food there was marvelous! I hope to create a post soon about some of the food that I enjoyed and some new cooking ideas that the trip generated. I returned from Italy late on Tuesday. I took advantage of my parents' living nearby to eat dinner at their home on Wednesday - as well as on Thursday, the night that I teach. I was looking forward to my first cooking on Friday, but we were pleasantly surprised to have a cousin from Alabama stop by unexpectedly on business. My parents suggested going out to eat South Indian food, which we did. Yesterday was Diwali, the festival of lights, and my Mom had a celebration and home cooking at her home (I contributed a side course Brussels sprouts dish). I was lucky enough to have a Servas traveler visiting me from last night through tomorrow morning, and prepared dinner for her tonight. 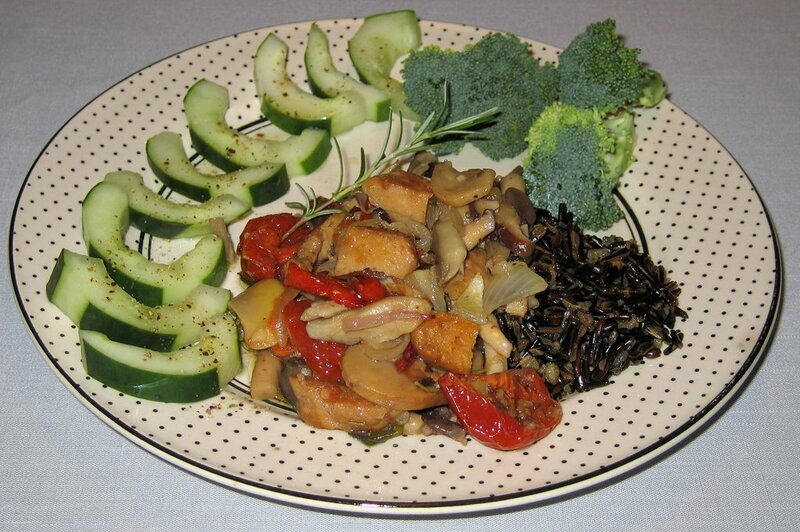 I sauteed a variety of vegetables, including potato, onion, shallot, broccoli, bell pepper (two kinds), and eggplant, along with tempeh. 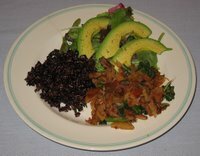 I served it with Lundberg Farms Black Japonica rice (short-grained black and medium-grained mahogany rices) and soy sauce. I purchased some great potato - onion - rosemary bread, and included a small piece, lightly toasted. I think that my new friend enjoyed the meal! It's great to be back in my kitchen! Oh, by the way, my wife went on to India from Italy and won't be back till the 31st. So I feel free to duplicate some meals I've made in the past till she returns, and see about extending my streak of unique dinners I've made for her since I met her in June 2004. Just before the trip, I made a simple meal on Friday October 6th. On the 7th, we had a potluck dinner - we left for the airport around noon on Sunday, and there was a lot left to do for the trip, so I only brought some prepared food (hummus and bread) for the potluck. Kosheri (Vegetarian Resource Group has a nice article on Egyptian vegan food, including a recipe for kosheri), a layered rice-lentil-carmelized onion-spicy tomato sauce dish, is a food that I loved being introduced to when I visited Cairo a few years ago. I even went to a restaurant or two that specialized and made nothing but kosheri. I wanted to put a quick meal together tonight and, vaguely inspired by kosheri, made a simpler rice dish. (I do want to try making kosheri sometime!) I cooked basmati rice in vegetable broth while deeply browning onions, carmelizing them nicely. My Mom gave me an interesting long spoon-like small pan a few days ago; it has a long handle ending in a metal "mini-pan" that is about 4" in diameter and 2" deep, and that has a copper coating on the underside where it can be heated. I was anxious to try it for browning pine nuts, and did just that. It works great, and the nuts brown very quickly! I served the browned pine nuts atop the rice. I also served leftover seitan with mushrooms and roasted tomatoes and heirloom tomato and radish. 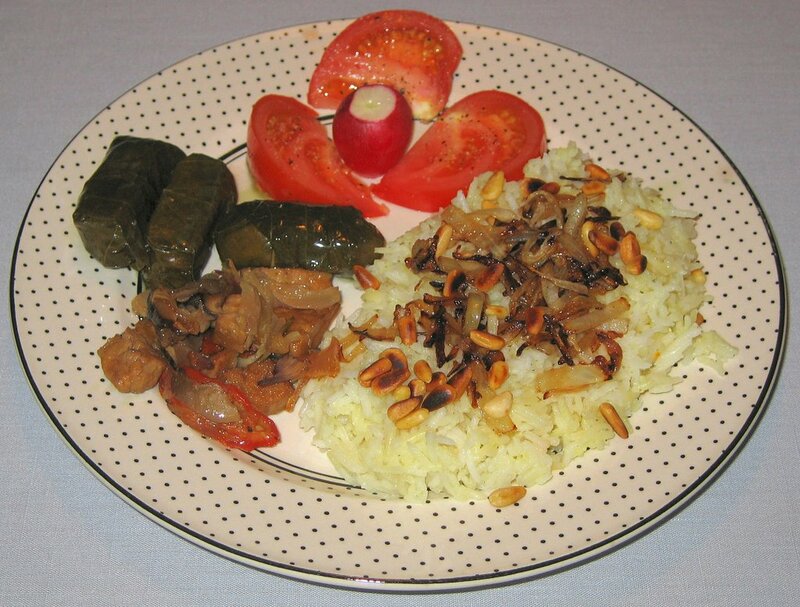 Finally, I broke open a can of stuffed grape leaves to round out the meal. I loved the conchiglie (seashell) pasta that I made a few weeks ago - the pasta holds heavy sauces well. 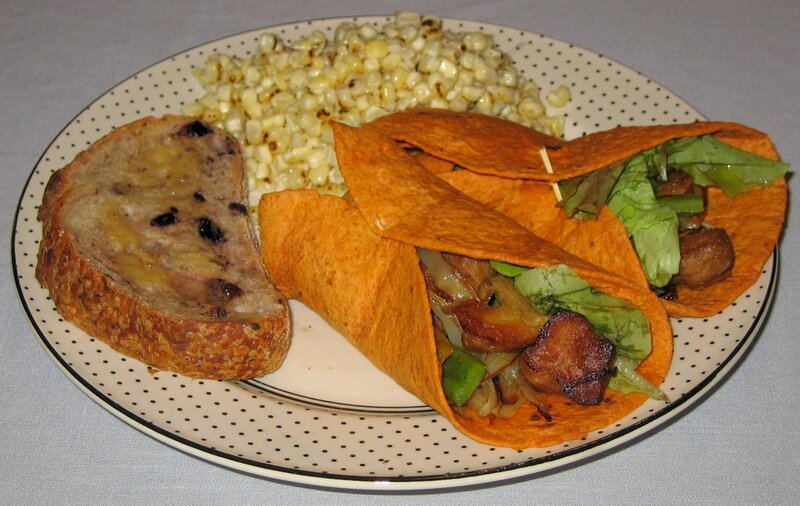 Today, I cut Field Roast Grain Meat Company's Apple Sage artisinal vegan sausage into little pieces and sauteed them, along with some bell pepper and onion. In the meantime, I began a sauce with simmering some chunky canned tomato, a little diced hot red pepper, and coarsely chopped basil and oregano leaves from my garden. (I should also have added garlic to add a little more punch.) Once the "sausage" and vegetables were browned, I added them to the sauce and simmered for a few more minutes. I served the very thick sauce atop the pasta, with some vegan Parma! "Parmesan cheese" sprinkled in. Today when I was shopping, I was lucky to spot a bottle of Sweetwater Growers' infused roasted garlic rosemary oil as a sample, and was given it to try for free! I put some of the oil on a chunk of toasted nine-grain bread, and was it good! We really liked the pasta, though not quite as much as when I prepared it alla Bolognese a few weeks ago. 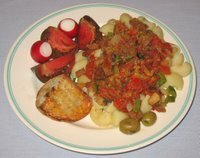 If I had made the sauce just a little stronger, with garlic or more onion, it could have more closely rivaled the earlier dish. But we had no complaints! This conchiglie pasta is a winner. We had leftovers from dinner on Saturday at Sage Vegetarian Restaurant in Chapel Hill - tempeh (which they didn't put enough of, and none was left) in a pomegranate reduction and eggplant dish. 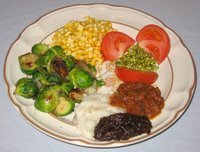 I made some whipped potatoes to serve with the leftovers and grilled Brussels sprouts with onions, including some Colgin Liquid Smoke that I added when I seasoned the sprouts. I also grilled some corn and added salt and vegan "ghee" made by clarifying Earth Balance. I bought some roasted tomatoes last week and loved them - why haven't I been cooking with them and perhaps roasting them myself? They are great on crusty bread, maybe with an olive, for a quick snack. Tonight, I sauteed red and yellow onions; when they were starting to turn clear, I added medium-sized chunks of seitan and shredded basil leaves and rosemary stalks from my garden (the rosemary contributed flavor, but I didn't serve the cooked stalks; rather, I put fresh rosemary as a garnish and then at the table separated the small stalk's leaves, eating them with the main course). After about 7-10 minutes, with the seitan lightly browned, I added the roasted tomatoes and cooked them for just a few minutes. 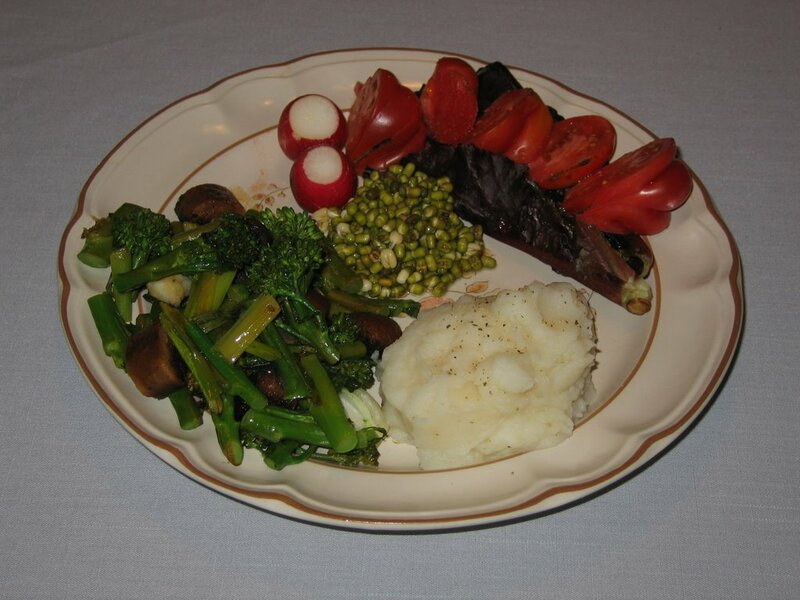 I served this main course to the side of wild rice, which I had cooked in vegetable broth. It came out well - I'll experiment with using roasted tomatoes more in my cooking.